Have you seen a lot of posts on “entitlement” lately? I’ve seen a lot of posts that cover topics ranging from how to tell if your child is entitled to combatting entitlement in your children. Yet, I think there is more going on in this generation and something that reaches far deeper than the “entitlement” umbrella that we are all throwing around. I think we are living in a Babylonian culture, and there are heart issues that have to be addressed for us to see a change in our culture and our children. With that theme playing in my mind last week, I had some interesting observations from my son’s 5th birthday, which was June 25. First of all, we had nothing planned for his birthday. And when I say nothing, I mean nothing. My husband was out of town, and I had a doctor’s appt scheduled that day to which I had to drag along my little fellows (birthday boy included). The morning started off great. I did give him a birthday card that said he was 5 since I didn’t give him a card at his party b/c he wasn’t 5 then…he loved the card and was happy. As I mentioned, I had to head to a doctor’s appt. 30 minutes away back in the City (we have moved and are in the ‘burbs now). I headed into the City with the boys early to wrap up some things (cleaning, etc.) at our old place before we turned in the keys. Naturally, with two boys things took longer than planned and I was scrambling to get something for Shaan to eat for lunch before the appt. There is nothing on the way but a McDonald’s, so I told him he was in luck and going to be getting a Happy Meal, and he was thrilled. All ok so far…. Then the fun began at the doctor’s appt. The receptionist/lady at check-in was talking to us and I made the mistake of telling her it was Shaan’s birthday. She proceeded to turn to him and ask what special thing he was doing for his birthday. So, I promptly pointed out that my husband was out of town with work and we had already had a party and celebrated a few weeks before. She then turned to me and said, “Well maybe you can do something special for dinner.” Evidently, our previous celebration was not enough. Well, folks, let me just say this appt ended in me going under the knife with the two boys (minor procedure, but still…) and then I had to drive back in Atlanta rush hour traffic with both the boys including a hungry baby that was sick of being in the carseat the whole time and wanted to nurse. So…for better or for worse, I was not thinking about planning a special birthday dinner. And as I mentioned before, we had already celebrated…. So, on the way home, I explain to Shaan that we are picking up take-out on the way in b/c Seth has finally fallen asleep in the car and I need to get dinner while he is sleeping because things are much easier that way, I need to feed him back at home, and frankly don’t feel like getting out of the house again that afternoon (if you are wondering why I am not cooking, remember, we are still living out of boxes, so lots of take-out these days). Somewhere along the way, the birthday boy BEAST was unleashed with all the seeds planted in his head about how special he was. I AM, AND THERE IS NO ONE BESIDES ME. Now all this probably seems comical and minor, but it really got me thinking about the “Babylon” in which we live. We live in a culture everyone is taught to live for themselves, and it starts at the earliest of ages now. Go to the supermarket and kids can pitch temper tantrums over which color car cart they get to drive while mom or dad is shopping. Most restaurants now cater to children with kiddie menus where they get a toy, or book, or dessert, or balloon. The other day we were at Chili’s here and they have now installed mini iPad-like devices at each table where you can order dessert, drinks, and play games at dinner. The table next to us had three children and all of them had one of these devices during dinner. If you think that is bad, let me tell you what my husband and I saw several months ago. Two families eating dinner together with all the adults at one table and all the kids (5 kids probably in the 6-9 age range) at one table. Each kid had their own individual iPad that they used throughout the dinner. 5 kids, 5 iPads. They didn’t even talk to one another during dinner! Here’s another example. For 5 years I have been cutting my son’s own hair to save on time and money. Up until now it’s just been easier. His hair is naturally wavy, so I don’t have to be a budding beautician to cut on it – if it’s not totally even, the curls disguise my chop job. A few times when we have been to my hometown visiting grandparents I have let my hometown beautician cut his hair, but otherwise he has never had a “real” haircut. Well folks, the little man is growing up and getting that fuzzy hair stuff at his hairline that needs buzzing with equipment I don’t have, and frankly with the new move and a 6 month old I threw my hands up yesterday and googled “haircuts for kids” in our new neighborhood. We ended up taking a drive to “Pigtails and Crewcuts” and let me just say that we NEVER had haircuts like this when I was a child – your own choice of a taxi, airplane, fire engine, or police car chair for the cut in addition to two regular chairs. A train table to play with while you wait (along with a whole other slew of toys). A “treasure chest” from which to pick a “prize” after getting a haircut (boy, I’m sure it was difficult playing with those awesome toys while you waited then driving around in that cool vehicle chair during the 5 min it took for the lady to trim your hair….) and then…if that wasn’t enough – there is a “marketplace” where they sell toys as well (so if the freebie from the treasure chest isn’t enough of a prize for your child after getting the coolest haircut ever, you can then buy them something for doing such a great job of getting totally pampered and catered to). Don’t get me wrong – the lady that cut his hair was great and I have nothing against her or the company or the iPads – we totally let Shaan play from time to time…it’s just that ALL of these “conveniences” to parents are really just teaching kids that I AM, AND THERE IS NO ONE BESIDES ME. My problem with this line of thinking is that it starts small, but morphs into the bigger stuff. The little girl in the grocery store turns into the adolescent who chooses to abort a child. I AM, AND THERE IS NO ONE BESIDES ME. The little boy at the restaurant turns into the husband who has an affair. I AM, AND THERE IS NO ONE BESIDES ME. Have you ever seen a little girl gaze at a pregnant lady’s belly and make a statement that they think the baby growing inside the lady should be killed? Quite the opposite – most children are fascinated with babies in the belly! But then the lie sinks deeper…Babylon around us takes a hold on us, and as we grow up we justify our behavior…I AM, AND THERE IS NO ONE BESIDES ME. It’s just a fetus, it’s not a baby…I AM, AND THERE IS NO ONE BESIDES ME. Have you ever seen a young boy make the statement that he wants to grow up and be the reason for a broken home? Quite the opposite – children are fascinated with happy families where mommies and daddies absolutely dote on each other. But again, as we grow up the lie sinks deeper and we justify our behavior to get what we think we want…I AM, AND THERE IS NO ONE BESIDES ME. I deserve to be happy and feel good….I AM, AND THERE IS NO ONE BESIDES ME. What I noticed with Shaan last week that was so interesting to me is that he was justifying his “wants” being ok because it was his birthday. That is a total Babylon mentality – justifying our behavior, making excuses, feeling we are “owed.” Feeling entitled. I AM, AND THERE IS NO ONE BESIDES ME. 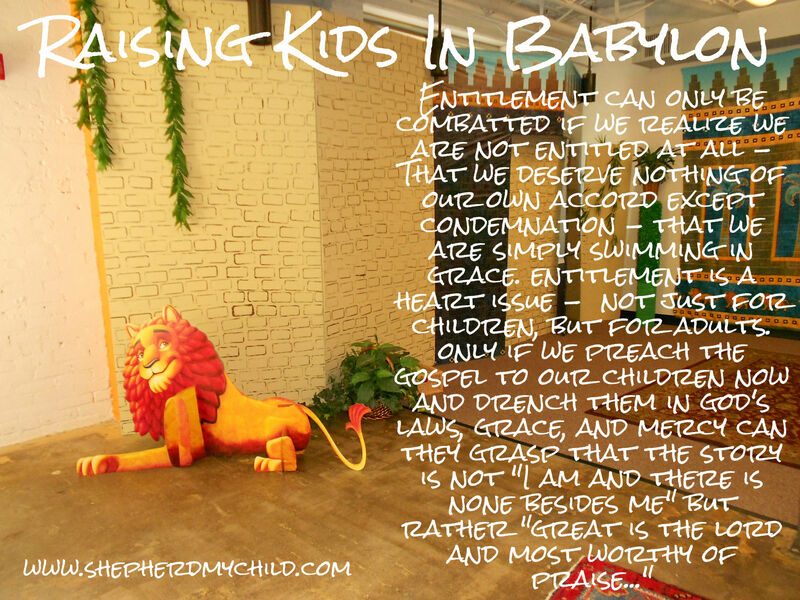 Moms and Dads – we have our work cut out for us – we have to steer our kids away from this mentality now before the Babylon we live in proves too enticing. Ah…praising God. Giving credit where credit is due. Taking the focus off ourselves – all glory is from Him and for Him. I AM, AND THERE IS NONE BESIDES ME…..
Folks – let the warning be clear to us and our children. We cannot continue to let our children see that everything revolves around them without dire consequences. I am preaching to my own heart here. No condemnation or judgment – I am as guilty as anyone. I must say “no” and explain why I am saying no – not just because things cost money and money doesn’t grow on trees, BUT BECAUSE WE ARE STEWARDS OF THE RESOURCES THAT HAVE BEEN GIVEN TO US – IT IS ALL ULTIMATELY GOD’S. We can’t just take the focus off our children – we also have to shift our focus onto the One who is worthy to be praised.